The trench warfare that took place during the Great War was some of the most chaotic and barbaric combat to occur in the modern era. While the First World War is often noted as the war that brought the technological art of killing to its zenith, it was very often the hand-to-hand combat in the trenches, settled with primitive weapons, that decided who lived and who died. The list of technological weapons advancements achieved during World War One is almost myriad. The machine gun allowed hundreds to be killed, maimed and wounded in mere seconds. This single advancement in weaponry certainly caused more casualties during the war than any other weapon and forever changed the face of modern warfare; ending forever the massed frontal assault as a primary combat tactic. Other weapons like the tank and armored cars were developed in direct response to the effectiveness of the machine gun. Still more modern weapons like the airplane and poisonous gas also made their power felt on the battlefield, again changing combat tactics forever. Massive artillery pieces, firing huge, high-explosive shells were developed in an attempt to destroy the trench systems that developed along the Western Front, which only resulted in the trenches becoming more complex, more heavily reinforced and the bunkers being dug that much deeper and built with that much reinforcement. With this stalemate of forces, new tactics were developed. Among those was the trench raid. The trench raid was typically conducted by a small band of men, under the cover of darkness. This allowed them to cross No Man’s Land, the desolation between the parallel lines of trenches, with some level of impunity, as the machine gunners could not see them. Once across the field of desolation, the group would explore enemy defenses. Sometimes they would simply perform reconnaissance, looking for (or even creating) gaps in barbed wire in preparation of a coming assault against the line, or looking for machine gun emplacements. Sometimes the raiding parties entered the enemy trenches. This could again be for reconnaissance, but also for the purposes of capturing a prisoner to integrate or simply to wreak momentary havoc; causing the defenders to lose precious sleep and having great physiological and demoralizing effect. During these raids, silence was imperative, so firearms were not a practical weapon. The up close and personal nature of the action necessarily required the most primitive of weapons, bare hands, bayonets, knives and clubs. For the defenders, in the dark and not sure where a fired bullet would strike (as likely friend as foe), these same weapons became the weapons of choice. The trench club took numerous forms during the First World War, evolving as the war progressed. Initially, handy pieces of stout wood, such as the haft of an English entrenching tool, or a simple shovel or pick itself, made an ersatz weapon. However, these were soon “improved” in the field. Clubs were both “factory made” and “field made”, and often the factory-made club was further modified in the field. 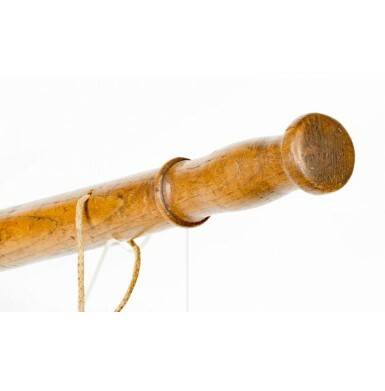 The typical club, regardless of country of origin, typically ranged in size from slightly over 12” in length, to just shy of 3’ in length; with most falling in the 16” to 20” range. The body of the club was usually of hardwood, turned round and tapered so the head was larger than the grip area. Grooves or other grip enhancements were standard, as was some sort of hole in the grip for attachment of a thong or lanyard. The piece of wood might be “enhanced” with some sort of metal end or reinforcement to prevent the head from breaking when it was used. 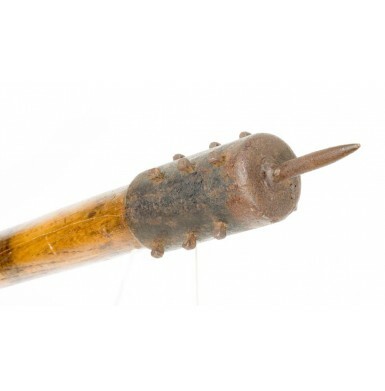 Additionally, anti-personnel projections might be added, from items as simple as hobnails or horseshoe nails, to specifically manufactured spiked and weighted attachments. The ends were sometimes weighted as well to increase their terminal effectiveness. Sometimes this took the form of simple iron or lead rings or inserts, and sometimes it involved more creative additions like the bodies of grenades or other ordnance. Over time, certain styles evolved. 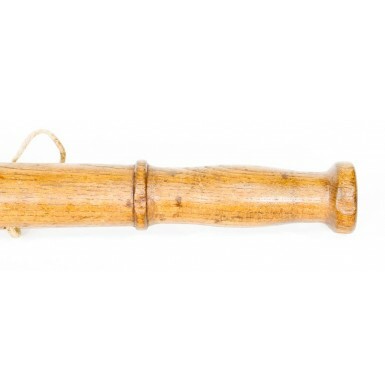 The British club tended to be a turned wood weapon, shaped very much like a small baseball bat or the classic London Bobby’s truncheon. 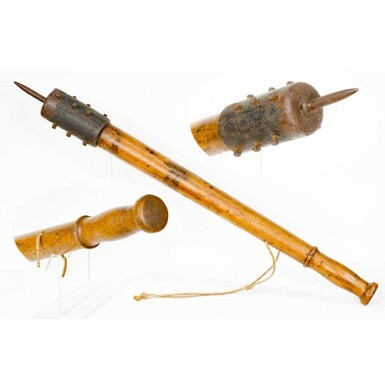 The simple, often mass-produced, wood clubs were often modified in the field to taste of the individual user. 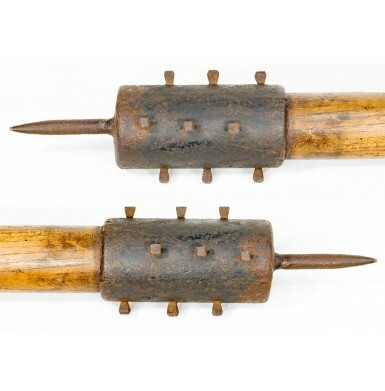 The Royal Engineers also produced special trench clubs with lead ring reinforcements that usually incorporated some sort of metal studs at the head as well. German clubs tended to be produced by pioneer and engineer battalions as well, with some units literally setting up ersatz factories in the field. These clubs often followed the basic British form of a bat shaped club with projections and additions at the top. The Germans also produced metal clubs with thin steel shafts with a weighted head. The most infamous and barbaric of the WWI trench clubs were certainly those produced by the Austrians, which primarily saw use along the Austrian – Italian lines in the Alps. These clubs tend to bring to mind medieval peasant armies brandishing maces and morning stars. 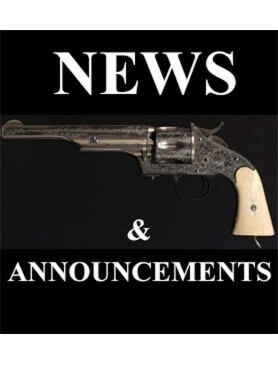 The Austrian clubs often included long iron spikes that protruded from the head, whose appearance was so wicked that the Italians launched a very effective propaganda campaign against the Austrians using images of Austrian clubs captured in various campaigns, with captions indicating the clubs were intended to kill Italian soldiers who had been rendered defenseless during gas attacks. While the use of trench clubs appears to be universal throughout the war by all sides, the Italians claim to have never used these weapons that they considered to be so barbaric. 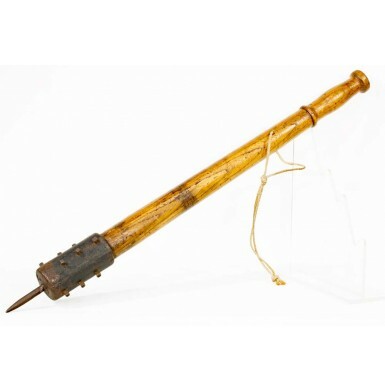 Offered here is a wonderful example of an Austrian First World War Trench Club. 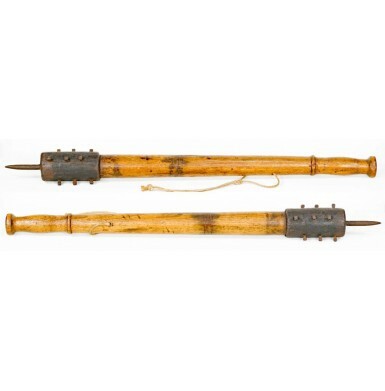 The Austrians took trench club manufacture to a high art during the war. The club appears to have started life as a “factory made” truncheon, which was then modified in the field to be a more effective weapon. The weapon uses the bat shape that was popularized by the British, a turned piece of wood in that classic shape. To this turned wood shaft a cast iron head has been added for extra weight and to reinforce the end. The head is further enhanced with twelve horseshoe nails arranged in four off-set rows of three and a 2.6” long spike that is about .4” in diameter. The club measures 27” in overall length, which is 8”-10” longer than most British or German examples but is not uncommon for Austrian clubs. The iron head is just over 7” in length and is about 3” in diameter. The shaft tapers to a comfortable 1.4” diameter grip near the bottom and has an enlarged, 1.5” diameter pommel cap at its base; to help ensure a secure grip when the club is swung. The grip has a palm swell and a raised turned ring above the grip area to help control the mass of the club when it is swung. The club has the expected lanyard hole in the grip, about .3” in diameter and roughly 2 ¾” from the pommel cap. An old hemp lanyard is present in the lanyard hole, but it is likely a later replacement. It shows nice age and good wear but is not likely from the period of use. The club is very heavy and weighs in at slightly less than four pounds (about 45 ounces or 3 pounds 9 ounces). This is about three times what the average British or German club weighed, but again it was not uncommon for the Austrian club to be massive, not just in length and appearance but in weight as well. The wood shows nice age, along with some light finish loss due to wear, multiple dings and mars, and some lightly scattered tight surface grain cracks. There are also a pair of small chips out of club; one from the raised ring of the pommel cap and the other from the raised ring of the palm swell. The chips are in line with each other, suggesting simultaneous impact on both rings. None of this in any way detracts from the appearance or displayability of the club, nor does it impact its solid and still quite usable condition. The iron head was originally painted black and retains some traces of that black paint. The balance of the iron is evenly oxidized with a deep, dark brown patina and some light surface rust. There is the expected discoloration to the wood where the iron has oxidized and darkened the wood. As with all the trench clubs that I have been offering of late, this club is 100% complete, correct and original in every way, with the possible exception of the hemp lanyard which is probably an old replacement. Overall this is a really attractive, very impressive example of a World War One Austrian Trench Club. This particular club is from the collection of noted trench club researcher, collector and author David Machnicki, author of At Arm’s Length – Trench Clubs and Knives Volumes I & II. This club is pictured and described on page 6 of Volume II. Real First World War trench clubs do not appear on the market very often, although well-crafted fakes do from time to time, particularly of this pattern. For any collector of Great War small arms, the Trench Club is one of the most intriguing weapons for that conflict, a throwback to man’s primeval urge to fight for survival using the most basic of weapons, in a war that featured the most advanced technology of the time.